Thanks to friends at Geneva College (Beaver Falls, PA) who allowed me to speak briefly at their sociology department forum on globalization last night. I had the great opportunity to supplement the interesting and insightful lectures, video pieces, and small group conversation with some hearty suggestions on books that help us live in this shrinking/stretching world, the hot-wired world Friedman called flat. I described basic stuff on global justice issues like Rod Sider’s Rich Christians in an Age of Hunger, to the insightful study of how the ideology of idolatry works to drive the inter-connectedness of the most urgent problems of our age, Hope For Troubled Times, by Bob Goudzwaard, Mark Vander Vennen & David Van Heemst, and Subverting Global Myths, the seriously profound and highly recommended critique by Sri Lankan evangelical Vinoth Ramachandra. We displayed more than a dozen different books on various aspects of the globalization phenom, and it was great to expose younger Christian students to semi-scholarly Christian books or activist guides to help them as they think through the implications of transforming faith in the 21st century. In the last meeting I participated in, I spent some time with a few valiant leaders who are helping foster conversations on campus about community involvement, service learning, social transformation, and justice advocacy as part of spiritual formation and theological witness, which is one of the tasks of their Center for Faith and Practice. My own less-than-stunning forays into public action became the jumping off point into talking about how best to sustain wholistic ministry that cares about word and deed (Good News and Good Works as Ron Sider’s book puts it.) There are quite a number of resources that can be used–DVDs and Bible study booklets and brief books that are designed for reading clubs or discussion groups and we are glad some of their folks may be using some of them. I suppose it shouldn’t surprise anyone that one of the things that comes up–in talking with youth, young adults, or any other cohort or generation—is the deep question of how to sustain healthy practices of serving, even standing up for social change, being prophetic, subverting the idols, rocking the boat, without growing overwhelmed, cynical or jaded. The Bible says not to grow tired of doing good. Isaiah 58 promises that those serving the oppressed will have intimacy with God as God shows up for us. Yet our world is full of brokenness, our lives are touched by sadness, and often our views of faith development and our experiences in church don’t particularly honor this human side of life East of Eden. What do we do with all this pain? 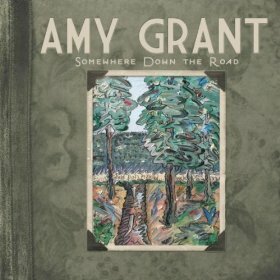 I put on the new Amy Grant album, Somewhere Down the Road. Think what you will about Amy as a symbol of CCM, but she is a smart, smart almost middle aged woman, a fine pop singer, and a substantial thinker. There have been tons of cheesy evangelical pop and not a few vapid, inarticulate evangelical stars, but, with a few exceptions, Amy has avoided the schmultz and has produced a serious body of entertaining and artful pop music. Her new album is a thematic one, about life as journey, about “road” as metaphor, and about the ups and downs of life under the sun. It is not quite Eccelsiastes, but she has named her own pain and broken-ness before, and this record includes some of those older songs (one in a bare acoustic version) that are in what Francis Schaeffer called “the minor key” of Christian art. For many of us, the hard stuff is not so minor, but a fairly major aspect of our lives. Not enough of the most popular Christian music admits that. You can read her description of the record here. We have the CD, of course. It sells for just $13.99. You can order it from us here.